Information technology (IT) resources are tested against numerous regulatory compliance mandates to ensure that they’re securing the sensitive data they store. However, because of the importance of meeting compliance standards, some organizations make the mistake of placing compliance first and security second – leading to future security faults and risks. Compliance regulatory agencies enforce standards that meet the minimum security needed to protect information. This is because regulations need to be rigid enough to serve a benchmark, as well as feasible for a range of organizational needs and technologies. 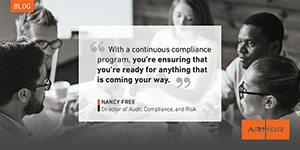 As such, meeting compliance should be treated as a baseline by organizations, placing greater focus and resources on implementing necessary security measures first. Compliance is an exercise of documenting and demonstrating how security controls meet a specified set of security requirements. When an organization focuses on security first, meeting compliance standards will follow. There are 5 security risk assessment methodologies that organizations can use to ensure that all compliance requirements are covered, while at the same time working for optimal security. Learn more about putting security first and the 5 risk assessment methodologies in our “Uncheck yourself” paper.